Vitamin C was the subject of the first controlled nutritional experiment in recorded history. It is needed for a healthy immune system, healthy bones, teeth and gums as well as helping to maintain normal blood fat and cholesterol levels. In addition to being an antioxidant in its own right, vitamin C facilitates the body in recycling other antioxidants such as vitamin E.
Vitamin C, being one of the fragile water soluble nutrients, is highly unstable and easily destroyed by heat and light, and it is not always possible to be sure how much is taken in the diet. Our daily requirement for it is higher than for any other water soluble vitamin. 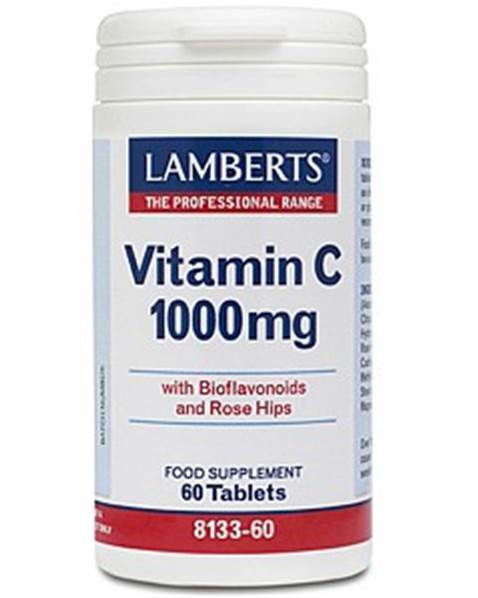 Lamberts® Vitamin C 1000mg tablets are one of our most popular forms of vitamin C, and provide adequate levels for those who have dietary insufficiency of this nutrient. 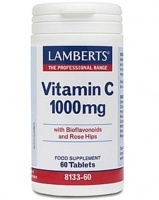 These tablets also contain a relevant level of bioflavonoids because they are known to aid vitamin C absorption, as well as a full 100mg of rose hips. Bioflavonoids have also been demonstrated to have specific effects including a strengthening effect on the capillaries. Individual bioflavonoids include rutin, quercetin, citrin and hesperidin.